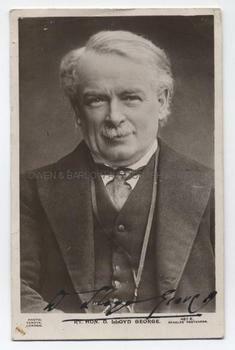 DAVID LLOYD GEORGE Photograph Signed. British (Welsh) Statesman and Prime Minister (1916-1922). Photograph Signed. The half length portrait shows Lloyd George in typical pose, with a slightly mischievous, truculent and forthright look at the camera. It recalls the words of Margot Asquith who said of him "he never could see a belt without hitting below it". The portrait by Vandyk, London is a real photo post-card by Beagles. Lloyd George's Autograph signature is written boldly across the foot of the image. Approx 5.5 x 3.5 inches. Slight crease to top edge and small pin hole at top left corner, else fine. Lloyd George was a tough, energetic politician whose coalition government led Britain throughout WW1. He is credited with the founding of the modern welfare state and other great liberal reforms. In a recent poll of academics, he was voted the 3rd greatest British Prime Minister of all time. This is a very attractive signed photograph with a fine Autograph signature.